We all can use assistance when it come to researching records that are not in our native language or an geographical area with which we are unfamiliar. 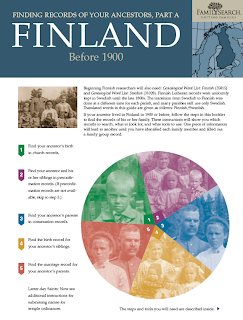 FamilySearch announced the release of a new research guide for Finland. Finding Records of Your Ancestors, Finland, Before 1900 is the last installment for the Nordic regions research guides published by FamilySearch. This guide provides you with guidance in researching public and private records, church records, hints and tips, gazeteers, naming customs and much more. This informative PDF guide is available for a free download in a PDF format from FamilySearch. If you would like to read the press release click Finnish Finding Records Guide. If you would like to go directly to the PDF of the Finnish guide, click Finding Records of Your Ancestors, Finland, Before 1900. The other Finding Records of Your Ancestors guides are also available for the following: African American, Denmark, France, Iceland, Italy, Jewish, Mexico, Norway, and Sweden. If you would like to view these research guides, click Research Guides and you will be able to view all of the research guides that are available for free viewing at FamilySearch.